Dad was a staff reporter. He also used to write for the EDP (Eastern Daily Press) and North Norfolk News all his life. And every week he had a deadline to meet, because he had to write this column for the North Norfolk News and he wrote under the pen name of Civicus. Which he told me was Latin for townsperson. And every week he had to dream something up new about what was happening in the town the latest news unfolding. He’d sit in the dining room with his head in his hands and numerous cups of coffee, with the dog underneath the table. And he would write and type and mum would go in and out with the news which she had come through on the telephone. 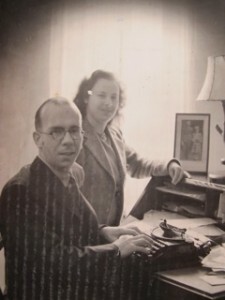 She was a commercial secretary; so everything was written in shorthand, so he had to decipher all of that. Perhaps we could go back then to your saying earlier about your parents meeting, and coming to North Walsham. If we could start at that point, that might be a good place to move on from then. Well, the story that I’m aware of was they used to live up on the Bradfield Road in North Walsham when they first got married, and they rented a bungalow up there. Well, it’ll be pre-1953 I would say. Then one day my mother was walking to town, and she noticed there was a parcel of land against the railway line which was an old orchard; and there was a sign in the garden and it said there was a piece of land for sale. So she went back and said to dad, ‘What about if we were to buy this piece of land and develop it and have a bungalow there? And possibly work from there.’ So dad, who was businesslike and forward thinking, immediately put in plans, which were granted. And then they had this bungalow built here by a builder’s firm called Barr, Gant and Vincent. Is that a local North Walsham builders? Yes. And then dad thought rather than go backwards and forwards to Norwich to work, that he would ask them if they would give him an allowance to have an office in a room here and work from home. And they said, yes, straightaway – to his glee. All the equipment arrived, he had a desk and a filing cabinet, and everything he needed; the typewriter arrived and all those years he actually worked in a small room in the bungalow. Mother, not to be outdone, as she was a commercial secretary, she then said, “Can I do the secretarial side of things: be the one who answers the phone, does all the advertising.” And people used to come up to the house with all the births, deaths, marriages and things for sale; every day a succession people came to the house and the phone was always ringing. And that was the life I was brought up into. And even as a small child, when people used to come to the door, mother used to put a finger to her lips and I knew I mustn’t interrupt, and the television had to go off, and the radio had to go off. And I had to be seen and not heard. So I read many Enid Blyton books in my childhood, because I had to occupy myself. So the bungalow you’re in at the moment was in fact the North Walsham branch of the Eastern Counties Newspapers. It was. And so many people passed through these doors over the years, an enormous amount of people, hundreds probably I would say. And some local news used to come in late at night. All sorts of different things. There was the floods in 1953; dad covered them. When the gas site [Bacton] first set up he took me there. And I often use to go with him as a child if he was out reporting, mum would have to stay here and man the fort so to speak. But I was the one who used to go with him, sparking a lifetime interest in people and community life. That must have been quite exciting. Oh, I loved it. I absolutely loved it. I spent a lot of time with my dad really, and he was also a lay reader with the church. So I used to get taken on a Sunday morning, sitting with him in the churchwarden’s pew. So very involved with the local community. Which was very important for a newspaper person. Yes. 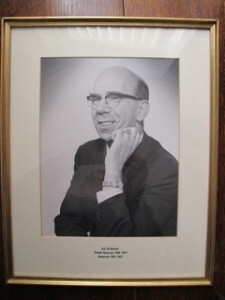 And he was also from 1974 to 1976 the vice-chairman of the North Norfolk District Council. And then in 1977 he was made chairman of the North Norfolk District Council. And he founded the Good Companions Club in North Walsham, which is going to this day. And many friendships have been forged over the years with elderly people who otherwise would’ve been on their own. And he was the sort of person he was very much for the community. And he was also on the Town Council. And he in his day was actually able to move families around in the town. If someone came to him and said could you help me please, I’ve had a big family now I can’t manage, I don’t need all these rooms in my house. And then he would be able to move them into a small property and people who had a small property and expanding family, he would then be able to move them into another property. Was this part of his job as a town councillor? Yes, as a town councillor. So much you could do then that now-a-days you couldn’t do. It’s now all done on points, isn’t it? It’s lost the social side of it, and all has to be done, as you say, through points and following rules and regulations. Whereas before it was a bit different. Yes, yes. And he also—he was the youngest member of a society called Toc H. Which I don’t know whether you’ve heard of, and I’m not quite sure what that was all about. I think he was about 19 when he joined that. But he was always very, very much a pillar of local life as I remember. So it was a very, very interesting life really. And he never had set hours. He would have to work according to what had to be done. And very often he’d do his typing during the day and the news would come in, and then he’d have his dinner. And then he’d have a shave, spruce himself up and off he’d go and he’d be at meetings somewhere. Often in the evenings at meetings. He used to be governor of local schools and things like that as well. So there wasn’t many a night he was really at home. So he was deeply involved in local communities. Very much so. Yes, yes, very much so. But unfortunately he didn’t have good health. When I was 23, unfortunately he passed away. He was only then 55 I think. And so my mum and I were left to our own devices really, and my mother was actually a widow for longer than she was married in the end. But because she was also so involved in all the work, she carried on. And she was like a town correspondent, and she also covered the news from the villages and that sort of thing. Mother carried on for many, many years after dad died. Battling with all the different news and she didn’t go out to report, but she did have all the news come into her. Still collected and gathered it in. Oh, yes. Gathered and absolutely loved it. And she also kept contact with the all the people from all the villages and they used to bring their news as well. And this went on and on and on, and she used to get me to run up to Norwich with the news sometimes (before it was collected in an EDP van). So that it met the deadline and very often the news was put into a brown envelope, and I would have to rush to Norwich and actually take it to Redwell Street or Rouen Road in readiness for print the next day. And did you go by train or—how did you get there? But as a child, I was sent on my bicycle up to the North Walsham Railway Station and dad had all the proper pre-printed envelope with the address of the firm, and he’d put all his news in there every day. And I had to bike up to the railway station and go to the guards’ room, and the guards would be sitting there in their uniforms, in the winter with a roaring fire, and I’d give them the envelope. And then it’d be put on the train, collected the other end, put to print and the next day it would be in the paper. They were very busy here all the time, my mum was very busy doing the secretarial side and dad the journalism. I used to be the errand boy, or girl if you like! And from the age of about seven I use to go down to town with wicker baskets with copious lists on a bulldog clip and go all the way around the town and do the shopping, and return all the goods back here again. So in your own way you became a very important part of that local North Walsham community. I was a cog in the wheel. Very much, I think really. And you were also saying about your mother carrying on until she was quite old. Tell us about how she worked and what she did. So she worked right up until she was 85. She did! And then of course the latest person who followed her, was Alex Hurrell, and she took over from her. But mother was very resentful of the fact that this new blood had come in after all those years, you know. It was just very, very hard for her. And when she finally gave it up, her health started to decline. I think she just gave up really. She couldn’t struggle any more. She was 85 when she finally gave up the job, said goodbye to the direct contact with Eastern Counties Newspapers and did she then become ill? Yes, she had heart trouble; she had kidney trouble, and, you know, she was failing in many ways, many, many ways. She wasn’t able to dress herself, or she wasn’t eating or drinking properly; she was quite poorly and I spent my time looking after her. And I was backwards and forwards coming here every day, but she never wanted anybody else. She never really wanted another friend and she never wanted to go into any sort of care. So it was quite hard really, ‘cause I used to go home and then she’d ring me up in the evenings and talk about all sorts of things for many years. Well, she was then living on her own and living with her own memories. And wanting to recall some of those memories through talking to people. Yes, it was very sad really. And as you can see in the photograph of her, she was still clutching her pieces of news and paperwork; still surrounded by everything that she had ever known all those years here. But she was falling asleep, she wasn’t meeting the deadlines. I think it was a difficult thing for the Press to have to tell her that she couldn’t carry on, and it was even more difficult thing for her to agree to accept it. But they brought her some lovely flowers, and they sent a photographer out and took lots of photos of her. And the photographer that came out from the press was the same photographer who actually did all the filming of Princess Diana’s wedding – how she enjoyed that. Where those photos are, I don’t know. But I think they must be at the EDP office somewhere, I would love to find out. But I do find that it’s very sad sometimes, I mean, I’m now live here; and I think of all that happened here all those years. This was an absolute hub of activity, news. And I can always remember as a child every day we’d have a death announcement come through Murrell Cork. And I was fascinated by this. I would say to my mother ‘what did he die of, mum’ or ‘what did she die of?’ And I was always given a stock answer: shortness of breath. (Laughs all round.) ‘Cause they could never fully explain to me why all these people kept dying. So that was how it was described as a younger person. But, yes, mother in her latter years was an absolute character. She really, really was a proper character. And she would never let anything get the better of her. Nothing, absolutely nothing. She sounds a very resilient and determined sort of person. Do you know, you’ve got it. You have got the exact words of how she was. In fact, I really, really wish in a way it was her sitting here telling you this story rather than myself. Because she’d have you here for a week, if not a month, telling you her life story; ‘cause she had so much to tell you. She really, really did. Are there any particular events that happened in North Walsham that your father and your mother were involved in reporting and developing; any sort of major things that happened over time? Undoubtedly there were many things. It was mostly the bread and butter they did: all the local organisations, announcements, advertising, all the clubs, and what was happening within them. And as I said, my dad used to write a weekly column with the North Norfolk News under the name of Civicus. And that had to be relevant to something which was topical in the town. And what I wish now is that I could tell you far more, because if I could’ve just sourced those old newspapers with those original columns, which I suspect I could get through the EDP. I don’t know how I’d go about that, but each week would have told the story on what he was writing about in the town. And that had gone on for years. But unfortunately, what he used to do, in his study, he had an old drawer from a chest of drawers, and he used to lay it underneath the window; and he used to keep all the back copies of newspapers so he could always refer back. Now, as the year went by or at the end of each year, mum would bundle each pile of newspapers up and they’d be put in the loft. Well, this went on for years. You can imagine how many piles of newspapers there were in the loft. Anyway, someone said to her unfortunately, when she got about 25, 30 years worth, you didn’t really ought to keep them up there, because if there was a fire…so, of course she got rid of them all, but I never knew where they went. So I now have no copies of his written word. But I have been thinking a lot lately that I would dearly love to get in touch with the EDP, and ask if they could somehow provide me with copies of his work under the name of Civicus. At least in the North Norfolk News. 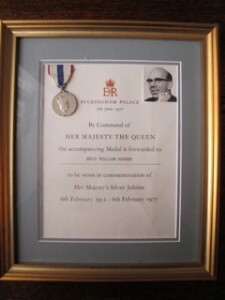 Many years ago, way back in 1977 I had a buff envelope come through the letter box, and inside it was an invitation, which my father had sent on my behalf, for me to go up to Buckingham Palace to receive a Silver Jubilee award and medal from the Queen. Which was awarded to him. He was far too poorly to go on his own, so I went up there and received it on his behalf. And that was at the garden party at Buckingham Palace. My mother was so proud to have that; really proud of that. She always had that up on display, all through the years; it got moved from one room to another room, but, that was her pride and joy. And he received that because he had done so much work for the community, not just through his press work really, but church work, council work and being governor of different organisations. And they actually named the library at the North Walsham High School after him. And a road was named after him down on Brick Kiln in North Walsham as well. So he has left a legacy, he really has. I know from what I’ve been told, from what I’ve read, he was a very, very well thought-of person, he was a most wonderful character; he was always truthful, he never said a bad word and he had a lot of integrity. What you call a pillar of the community. And was able to represent the community, not only through the Eastern Counties newspaper involvement, but also through his church and through his other local community work. He never turned anyone away. Never.